Flavorwire recently posted a wonderful piece looking at what 10 famous authors have said in the past about the solitary, introspective act of keeping a diary. Inspired by that article, we decided to extract the best observations and truisms we learned about journaling from those 10 brilliant minds. Tell us in the comments section below what you think of these insights – and, indeed, if you have any of your own – and definitely check out the full article from Flavorwire here. Virginia Woolf observed that writing for no audience – writing just to write – is great practice. “It loosens the ligaments.” Her diary writing, she noted, is rough and ungrammatical. She tended to write in her diary at a quick pace, “with no more pause than is needed to put my pen in the ink”, and, though looking back on these entries was embarrassing and mortifying, she traced improvements – “some increase of ease” – in her professional writing to all those casual half hours spent with her diary. 3. 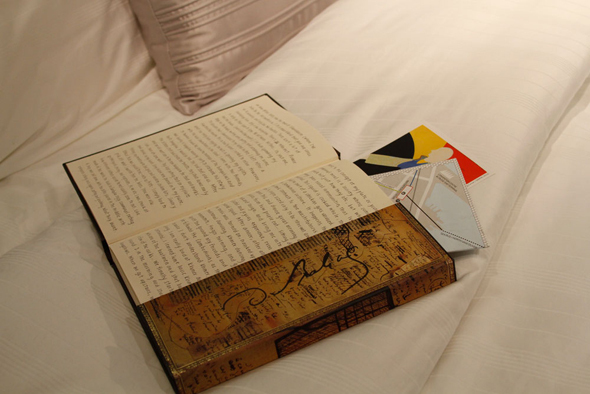 A Diary Is Not Meant for Others’ Eyes… Or Secretly Maybe It Is? Susan Sontag talked about a time she read someone else’s journal and, specifically, about reading that persons’ true (and “curt, unfair, uncharitable”) feelings about her. “Do I feel guilty about reading what was not intended for my eyes?” she asked herself. No, she doesn’t – because she believed that one of the functions of a diary – a function we would more than likely deny to ourselves – is to be found and read. A diary is the one place where we have the opportunity and the luxury to be truly, cruelly honest, and it’s not inconceivable that we would secretly – dangerously, even – want others to learn those true thoughts. Anaïs Nin, on the other hand, said she writes to discover “the moments of revelation.” She actively chooses to write about heightened moments – “moments of emotional crisis” – because these are times when “human beings reveal themselves most accurately.” Keeping a diary, for her, was essentially about coming to better understand herself. C.S. Lewis, also looking at the darker side of keeping a journal, wrote about the trap that one can inevitably fall into with the act of keeping a journal. Writing in his journal in a state of mourning after the death of his wife, he questioned whether writing about his grief as he did actually had the unintended effect of aggravating it. Part of every misery is, so to speak, the misery’s shadow or reflection: the fact that you don’t merely suffer but have to keep on think about the fact that you suffer. I not only live each endless day in grief, but live each day thinking about living each day in grief. Do these notes merely aggravate that side of it? Merely confirm the monotonous, treadmill march of the mind round one subject. Maybe what she was referring to was that you have the moment you lived and then you have the moment you’ve written about – something you can always refer back to. Franz Kafka believed that referring back to old journal entries – looking back on situations, life changes, old sufferings – gives one a kind of reassuring feeling. You look back on these situations and times – some “which today would seem unbearable” – and you realize you lived, you survived. You were even able to write it all down! And doing so can lead to great wisdom about the self. Jonathan Franzen also talked about the insights he gained from looking back at old journal entries. He speaks of the feelings of mortification he felt from reading even day-old entries, discovering his own “fraudulence and pomposity and immaturity.” These insights made him desperate to change himself, “to sound less idiotic.” His journal entries, he attests, led him to a private commitment to personal growth. Tell us what you think about these insights and observations below. Do you have anything interesting to add about the act of keeping a diary? I love this. It’s true. Very cool! We wish you the best of luck with your first journal. As Douglas has said, you will really treasure your journals in the future. How goes the journal? I started around your age and am still going strong 6 years later. It’s made a huge difference, especially once the addiction got its claws into me xD Never could keep up the once daily habit, but just writing whenever the mood takes you is a great trick. Go for it and good luck! I started keeping a journal when I was your age. I am 36 years now and there is nothing more amazing than decades of your life recorded in its,most raw form, on paper, except for, maybe going back in time and reading it! for not positioning this post upper! Come on over and talk over with my site . Made me laugh and a great example to keep a diary. I keep journals and I loved reading this article. Thank you so much. I was particularly affected by the Joan Didion quote at #5, saying the keepers of journals were a “different breed” of people and “children afflicted apparently at birth with some presentiment of loss”… I sort of understand that. Very motivating information you have remarked, say thanks a lot for submitting. Unbelievably absorbing elements you’ll have remarked, thanks a lot for posting. I enjoyed these observations greatly. I admit most of my entries to be belly button lint. Still over the years the range of lint types gets more interesting. I am better able to share the wonder. But I did come to this post hoping to find an app for my iPod Touch as this is where I do my journal. Any tips from the distant stars? Today – now sitting here with my lap top running – is the first time I have ever entered “keeping a diary” into my browser, and what is written above is interesting. I have kept a daily diary – average about 300 words – since 1958. I am only a year off of eighty now. I was, post university, to serve National Service in Britain. I was taken into the Royal Navy and, because they lliked me and me them, I did 12 years. A personal journal was required and that habit has remained with me. Many years of writing into a pad with a fountain pen. Then learning shorthand to reduce the paper volume. I have a pile of bound files in my garage here in Lincolnshire. Now, of course, I use the computer, typing eight point into a word processor, printing it when it amounts to several A4 pages, and binding it. I add an occasional page of photographs. There is an important value to keeping a diary: each evening when you put it together to record the day, you must think about what you have done and why. There is a analysis of personal behaviour and action. Wisdom is applied and tomorrow often results in amendment of today’s slight failings to get things absolutely right. I love looking back to see what I was doing on New Years Day in 1972. How much the beer cost – who was with me (often gone now) – who was running our country – ladies have given up wearing nylons – how much does it cost to fly the Atlantic? Diarying is fun and rewarding! Wow! Nearly 60 years of journalling! It’s great to hear that you’ve managed to keep that up while incorporating digital elements like the laptop. We’d love to take a “Peek Inside” your journals and find out more about the changes you’ve tracked over the years! If you would be interested in sharing your story further with us, please send us an email at facebook@hartleyandmarks.com. As a counsellor I tell my clients the reason to journal is like self-therapy. You begin to understand yourself better and your emotional reactions to life events. Knowing that emotional responses are what determines relationships you are more apt to better understand previous error and what needs adjustment. And it is documentation if anything should come to light in the future. We cannot depend on tomorrow, we only have today. Thank you for sharing! It’s always inspiring to hear how people use journals in their everyday lives, and it is wonderful to know that you use writing as therapy in your practice. I jut started book #57 yesterday, January 1, 2017. I’ve graduated from the college spirals (in block series of every color) to the 400 page year long black vinyl extravaganzas. I thought nearly 30 years was long, but the lovely gent in the U.K. got me beat by half a century. Good on him. I only need at least several large wheelbarrows to transport The Library of K.
As the decades pass, I find I’m removed from the person I was, even if it’s only a few years ago. And I’m still in the process of pulling my head out of the sand. WRITE ON! Wow! At the rate you are writing, you should have no trouble catching up with John Gadd! All the best with #57! It is not what a man wants to do, nor what he needs to do, and not even what he does well that creates a man’s destiny. Instead it is that which he must do, the one thing he cannot not do and not try to accomplish. That one thing reveals his very purpose for being alive. It is his calling. My journals are my calling. I have failed, as well as failed to succeed, at everything else in life. Lisa has my heart. These journals carry my soul. Please take care of them. Thank you for sharing your story! What an amazing accomplishment to be able to look back at 38 years of journalling. We’re glad to hear that your journal has been such an important resource in your life, and that you’ve been able to work through your innermost feelings in good times and bad. Your journals will certainly be a treasured heirloom for your daughters and family in years to come. Wishing you many more happy and healthy years of journalling! I am 55 years old and I have been kepping and have been writing in a diary / journal every day of every year, since 1974 when I was 11 years old. My mother bought me my first in 1974. a small pink one, in 1975 I got a black one a little more grown up. Then in 1976 yet another just like it. I didn’t want another but wrote in it all the same. Then May 1976 my mother died. I couldn’t possibly stop now! My mother wanted me to write my thoughts So every year I bought a New diary. 1n 1979 I believe I could not find a diary so I didn’t write that year except in a notebook. Years later I transferred those notes into a more proper journal. I always try to stay with the same diary each year. the last 25 years I have been writing in Letts Of London journals. Sometimes I switch the colors. I usually decorate the front and back of it from the year of my most favorite things Or things I am passionate of and believe in. Vegetarian stickers, photos, whatever has been monumental that year. Aside from writing I put concert tickets, playbills covers, play tickets, photographs, plane ticket stubs. For a few years in the early and mid 80’s I would have celebrity friends write me notes in it. Every day I write my thoughts, but mostly my days events. One year I wrote in Red Ink every day. Over the last 15 years all money I make or receive I write down. This year each month I write in a different color ink. I am now on my 44th book. They are all together locked away in a storage space under my desk at home. When I lived alone and before I had children I would display them with my books in my large book case. I also have been logging my night dreams. I started in 1977 when I was 15. I now have close to 1,400 dreams logged. They are In 5 Boorum & Pease log books with 301 pages per book. 1 Dream per page unless I remember more then 1 dream in the same night or afternoon nap that goes on the same page. I am now on my 5th book. The first book on the spine says 1977 to 1985 and so on. I am now on 2016 to .. I truly Love books, pen & paper.. I hope that is what heaven looks like for me. I have never met or spoken to anyone who has done what I’ve done. I have had a very colorful life So this will be interesting reading in the future. Thank you so much for sharing your story! What a beautiful way to stay connected to your mother, and to pass down the tradition to the next generation. Keeping a journal helps me to sort out my life, to make sense of my behavior. When things are a little off in my life, I reflect and write about it. I have been keeping a journal for over 20 years, as did my mother and my grandmother. I have thought about writing a book where I would discuss themes that arise in each person’s life. Relationships, conflicts, resolution, for example. I also wonder if my daughters should read my diaries when I am gone. I am brutally honest in my writing and not sure I want them to read all that I have written. Thanks for sharing! We love when journalling is passed down from generation to generation, though we certainly understand your trepidation about letting your daughters read your most private thoughts. Keeping track of different themes that come up can be really illuminating, and your idea of starting book sounds really intriguing!